Be sure to see the main OWU Blackboard page. As you open content, it slides out in a layer. You can easily see where you’ve been and navigate back to any spot. The system automatically saves as you create. Review, refine, and share your work when you’re ready. Courses are automatically organized by term. New Tools: Organizations, Content Collection, and Portfolios. Organizations are groups that behave like courses and allow group members to communicate and share documents. Content Collection allows you to store, share, and publish content in personal or course folders. Link to files, instead of creating copies of them in each course. Portfolios can be used to collect and organize content that represent the work done over time. Go to bb.owu.edu. 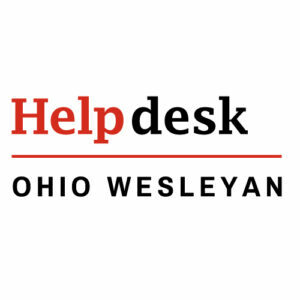 Enter your OWU username and password (the same ones you use for BishopApps). Click on “Courses” in the left sidebar. Students will now see all courses they’re enrolled in, but will only have access to the courses that instructors have made available to them. Details about the course, such as its description, and contact info for the instructor, are readily available. Hover over the course box and click on the “i” symbol for a course description or click on the envelope symbol to contact the instructor. Some notifications about course activities are always on in the Ultra experience, and you can’t disable them. Plus, you will have the option to choose your notifications at the system level rather than the course level. These notification settings apply to both the Original and Ultra Course Views. Currently, Organization activities won’t trigger email notifications. Notification Settings are accessible from the gear icon at top right on the Activity Stream, and also on your profile page, under System Settings. Learn more about the Ultra Notification settings. On the Upload Assignment page, Students can add comments and specify files to attach. Select the Content Area from the Course Menu that holds the Assignment. For example, the Assignments area. Click the name of the Assignment. The Upload Assignment page appears. Complete the Assignment Materials text box if necessary. Click Browse My Computer and select a file to attach. Enter a Link Title. If the field is left blank, then the file name becomes the link. Click Submit when the page is complete. Instructors may create Assignments where Students do not need to attach files to complete them; Students can submit an Assignment without attaching a file. If Submit is selected, and no files are listed to attach, the Assignment is submitted and is no longer available to the Student to complete. Assignments can only be submitted once! Access your course. Click Tools from the Course Menu. Select the My Grades link. On the My Grades page, assignments and grades will be listed. If the assignment has been submitted and graded, the points will be displayed. Click the grade link to view your submission history along with instructor feedback. Click OK to return to the My Grades page. Note: An exclamation point indicates that the assignment has been submitted successfully and is waiting to be graded by the instructor. A paper and pencil icon indicates that the assignment has not been submitted because it is saved as a draft. Blackboard is where your instructors upload their syllabus, lecture notes and other course material. You can download this material online from on campus or at home. All courses taught at the university have a corresponding Blackboard course and all students and instructors are automatically enrolled. Please note that this does not, however, indicate whether your instructor is choosing to use Blackboard within their course. Check with your instructor to see if they have made any course content available to you online.